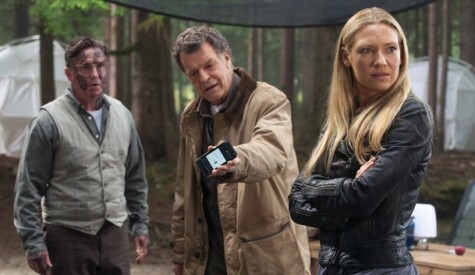 Fringe Season 5, Episode 3 Review: "The Recordist"
History is one of the most important aspects of our society. Why do you think we take the time to study it? We feel like we can learn from our ancestors, move on from our past mistakes. But for Olivia, Peter, Walter, and Astrid, what the world of 2036 considers history is still their present. The world that they left behind 20 years previously is all history now. And if the Observers win, all of it will be obliterated. But as “The Recordist” shows, even if you make the smallest impact, history will remember you…no matter what some omnipotent bald people might try to do. “The Recordist” is a return to the Fringe of old, with a plot that only slightly enhances the storyline, but is perfect fodder for well acted (if slightly overwritten) monologues about science, life, and (in this episode) courage. Usually, Fringe knocks these out of the park, and “The Recordist” was no different. Both the Olivia-Peter conversation and the conversation between the archivist and his son were touching…although extra points have to be given to the Olivia one. Olivia’s explanation for her failures as a mother made sense, and so does Peter’s quick words of comfort that she’s not. I don’t know how this happened but, somewhere along the way, Olivia and Peter became a great couple. I think most of the credit has to be given to Anna Torv and Joshua Jackson, who have great chemistry together and really sell the pair’s relationship. I want this couple to actually be happy together, which is more than you can say about a lot of TV relationships. The other aspects of this episode outside of the two monologues were definitely weaker, though. Don’t get me wrong; I liked “The Recordist,” and found myself emotionally touched and empathetic in the way that no other show but Fringe (and in its heyday, Lost) can make me feel. Maybe its a combination of the always wonderful score and the aforementioned monologues, but this show does a really good job of just getting to me. Edwin’s sacrifice at the end of the episode was great, as was the son’s monologue that closed out the whole episode. But despite those things, this definitely felt like a weaker episode of Fringe. But that’s not necessarily a bad thing. Following the two very plot heavy episodes, maybe it was a bit nice to return to a more Monster of the Week type one. Judging how we’re already a fourth way through this season (gasp! ), this might be the last chance we get for a while. So yeah, “The Recordist” didn’t do anything particularly special plot wise, but in terms of building up the world of the future and psyche of the people that inhabit it, it was a decent effort. The history machine was a pretty cool way for Fringe to show of its FX budget…what’s left of it, anyways. Walter taking credit for finding the first tape, and Astrid’s face following it was hilarious. Walter trying to use his old bong was also pretty funny, but any moment involving Walter and drugs is. Why is it that Peter feels nothing about his current condition in life? I guess when you find out you’re from another universe and that you alone have the power to decimate one of them, and by doing so you will be erased from EXISTENCE, skipping two decades in the future is no big deal. Well everyone, sports is once again screwing us over, as Fringe takes a break next week. Check back in two weeks for our thoughts on what seems to be a pretty plot driven episode, “The Bullet That Saved the World.” Ohhh, cryptic!